Someone sent in a drinking game you can play when listening to the podcast so we discuss it and partially play it as we record. We are @FJComedy on Twitter, Periscope, Instagram and Snapchat. 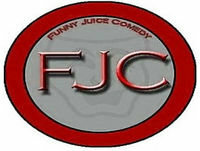 E-mail funnyjuicecomedy@gmail.com if you would like to sponsor an episode or if you have a suggestion or topic you would like to see us do an episode of in the future or fill out the form on our website. New logo and website designed by primeencode.com and if you like it please go to them for your business needs.